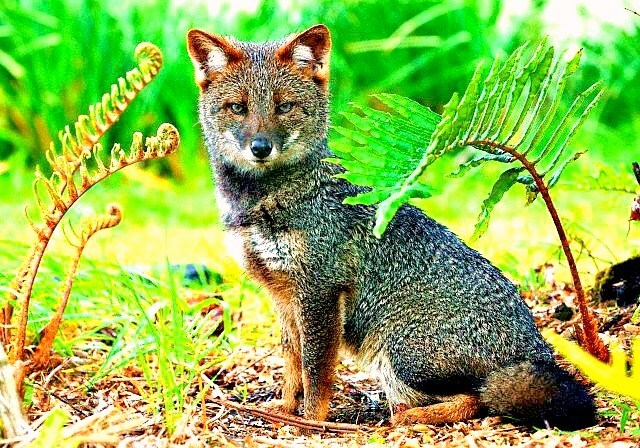 Discovered by Charles Darwin during his voyage aboard the Beagle, Darwin's fox is one of the smallest fox species in the world, with a stout frame, elongated body and short legs. The muzzle is small and thin and extends into a rather rounded forehead, and the tail is relatively short and bushy. The thick coat is a dark grizzled grey to almost black colour, with a distinctive rusty-red colour on the lower legs and around the ears. The abdomen, chest, underside of the muzzle and the inside of the ears are a pale cream to white colour, and the tail is dark grey.